A knitting-group discussion among friends about what the perfect yarn shop would look like turned into a business plan that resulted in a new store on the near-northside. The Hook and Needle Nook opened in June in the St. Cloud Building at 1508 N. Monroe St.
“I wanted this to be a haven for fiber artists,” owner Esther Wheeler said. She sells both hand-dyed and commercial yarn. The hand-dyed yarns are made by three local fiber artists and include everything from silky cashmere to more workhorse fibers. Handmade project bags designed by a friend of Wheeler are also for sale and offer a charming way to tote works-in-process. However, the 1,700-square-foot leased space offers more than yarn, knitting needles and patterns. Wheeler hosts on-site workshops on spinning, weaving, knitting and more for all levels of interest and experience. Knitting groups meet Tuesday evening and Thursday afternoons, and Weaving Wednesday launches Sept. 19. Folks are welcome to bring their projects in during store hours and settle into the comfy leather couches in the “Knitting Nook” while they work. There’s a kid’s nook and a husband-friendly space available, too. Work by local fiber artists adorns the walls. 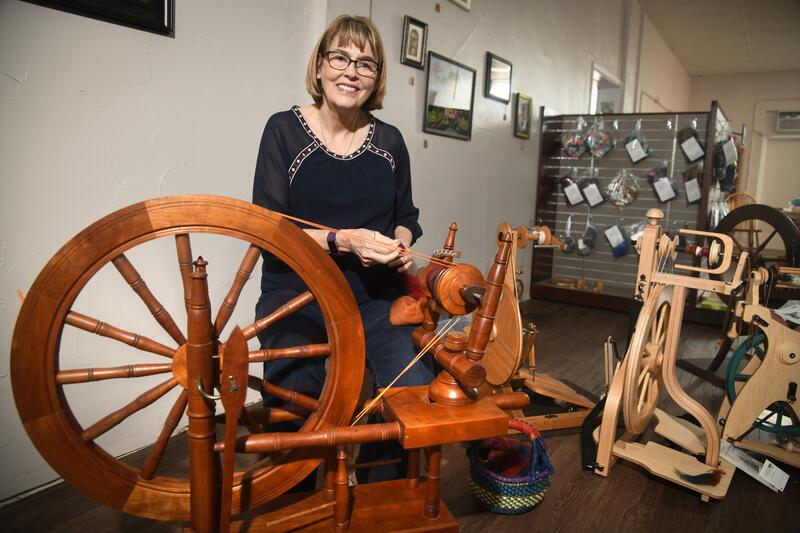 “I’ve made this a place where fiber artists can display and sell their work,” Wheeler said. “When people get their hands busy with yarn, it becomes art,” she said. This is Wheeler’s first venture into business ownership. Originally from Texas, she holds doctorate in biochemistry and retired from the University of Texas at San Antonio at 55. “The only thing worse than being a woman in Texas is being a woman in science in Texas,” she said. She and her husband, Robert Jundt, moved to Spokane in 2006 to be near his children and grandchildren. Wheeler had taught herself to knit as a child, but life as a busy academic didn’t leave much time for leisure. After moving to Spokane, she connected with a local knitting group and found friendship and ultimately a new career. For help in turning her dream of a yarn shop into a reality, she turned to Spokane Public and Spokane County libraries. “The libraries here in Spokane were instrumental. They have amazing resources for small-business people,” she said. Wheeler also found help through the business mentorship program SCORE. She said she chose the North Monroe location because it’s halfway between North and South Spokane, and the building boasts a small parking lot in the back. “The 115-year-old building fits with my philosophy of doing this: taking something old and making it a work of art,” Wheeler said. With her husband’s help, she divided the ample space into several cozy areas, including a Loom Room/Weaving Nook and a Spinner’s Nook. Antique and newer-model spinning wheels are available for those who like to make their own yarn. Visitors will find a variety of looms from table-top to floor models near the spinning wheels. Wheeler has a weakness for looms. Though summer can be a slow time in the knitting community, Wheeler is pleased with the welcome she’s received. “When you create something, you put a little piece of yourself in it,” she said. From the art on the walls to the yarns on the shelves, she’s filled the store with unique items and things that speak to the artist in her. Published: Aug. 23, 2018, 5 a.m. Updated: Sept. 6, 2018, 5:09 p.m.